Absolute max capacity of Hyster S155XL or CAT TC150 or CAT GC70K forklifts ? Thread: Absolute max capacity of Hyster S155XL or CAT TC150 or CAT GC70K forklifts ? with temporary added counterweight ? All three rated 15,500 lbs with standard counterweight. 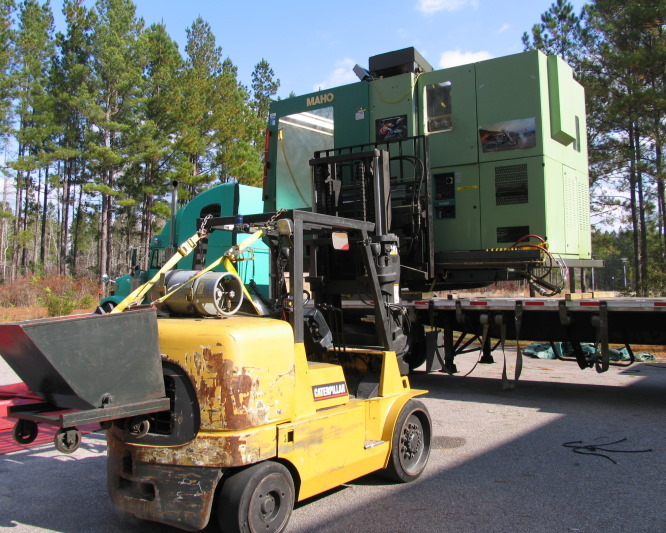 For example I once lifted a Maho MH800C machining center which weighed 13,600 lbs with a CAT GC70K.... which sounds within the 15.5K capacity except being a VMC I was picking it up way beyond the 24" load center rating....probably the equivalent of lifting 20,000 lbs at 24" really. What I need to unload/load now is a VMC that weighs 15,300 lbs and just wonder if one of those three lifts might do it with extra counterweight ? Hard to say since I don't really know how far off 24" load center I will be. Thoughts ? Innovative counterweight addition(you related to MacGyver?). I'd want to close up the added variables of open ended hooks and open ended chain hooks. Personally, I'm going to be building a shelf that will pin mount to the hitch pin of my forklift. This way, it is low to the ground and affixed to the lift while being removable as well. I may have to weld a pair of tie-rod mounts for the far side of the shelf. Back to your question-- doesn't it partly depend on whether the lift has relief valves to prevent overloading? I moved a 12,500 lb Haas VF3 with a Hyster H155, that's the pneumatic tire version. I was able to pick it from the front. I figure most of the weigh is in the column at the back, so I was impressed. Don't know if that helps. I’d say you probably won’t be able to pick it. Do you have even a 5,000 lb lift you could put on the other side? It a big difference in what you can move low to the ground and what you can unload off a truck. Actually due to mast angle you can lift more off a truck that you can off the ground....the problem is you eventually have to get it to the ground ! Bottom line is if you can lift it off the ground/assuming level ground and have your mast angled all the way back, the load gets geometrically closer to the counterweight and therefore more favorable as you go up. 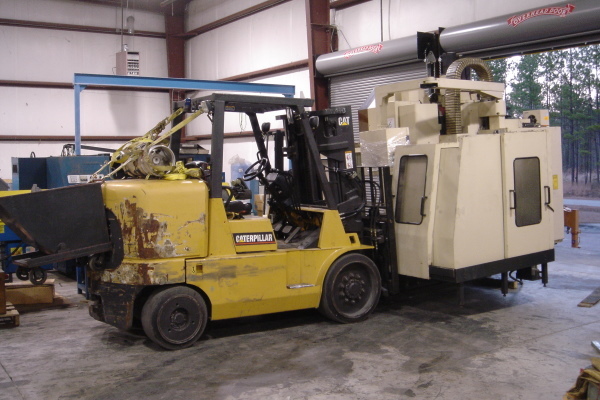 I have another Hyster (see below) that is rated for 8,000 lb but due to 3" thick steel plates bolted on the back can lift at least 9,500 lbs. Yeah, pulled the two forklift trick years ago loading auction iron in Greensboro, NC. That's me on the right and PM moderator Mebfab on the left. Woodland Hills, Ca. and some times Hutchinson, Ks. 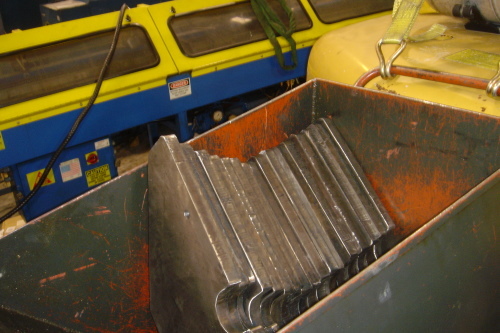 I have lifted about 120% of the rated capacity of my big Hyster at about 36" load centers. that was a big Thompson grinder, I had 2200 pounds of weight on the back. My big lift is a longer WB than the 155XL. With my lift the tires are pneumatic, I increased the pressure to 120 vs the listed 110. For pneumatic tires in heavy haul the manufactures list overload ratings and pressure rating. With hard tires wheel weigh is not as much an issue, steering unloaded with added weight is more of a consideration, try to start moving before making large steering adjustments. I have lifted 20k++ lbs at the mast with an S30E Hyster and never had the hydraulics bypass (Lifted 1/2 of my boring mill). I worry about keeping the rear tires close to the ground, not if the hydraulics will handle it. With my current 3k Komatsu a 5x5 tube fits right into a slot in the counterweight. A couple hundred pounds 10ft out makes it pretty capable. The main stress areas on a forklift are the forks ,especially the bend,and second the mast rollers.......really old lifts dont have rollers ,but long bronze strips.....in fact the WW2 5 ton Clarks have masts built like a battleship,but the forks are breakable just the same. That is one of the problems with being close to tipping when unloading a machine, if you are very close to tipping when you lift a machine off a truck bed, you take the real chance of turning over when lowering it to the ground. When you are close to capacity, best mode of action is to lift it, have the truck pull out, and let down relatively fast without stopping. Also, you raise the rear wheels when a machine is 2" off the ground, it's uneventful, you raise the rear wheels with the machine at truck bed height, you've got major problems. One good thing about using 2 forklifts, one on each side, is you can essentially move the weight on the forks all the way against the mast on both lifts. Since most forklifts are rated at 24" out on the forks, you can increase the capacity quite a bit by moving the weight all the way to the mast. All forklifts are, are a simple lever with wheels, all the same rules and calculations apply. I've never seen a forklift that had a satisfactory hyd system, that wouldn't raise the rear wheels before stalling. Usually the tilt circuit is the weakest link when adding more counterweight. I've seen lifts that were overloaded, be able to tilt fine with the load close to the ground, and get the load toward the top of the mast, and overload the tilt cylinders. I've even seen lifts start tilting out on their own with too much weight near the top of the mast. That is a very bad situation. Most people have added extra counterweight at one point or another, I've done it myself, but realistically about all you can expect is about 10% over on most lifts. I've seen lift chains break, mast break, and cylinders break, and rear axles break from the load of extra counterweight. I've never seen a front axle break, but that is a possibility also with overloading a lift. I've also fell through more floors than I care to count. We once dropped a 300 ton press when the floor fell though. We were laying it over, and the top of the press was about 8' off the ground. The forklift was near capacity, but within the chart. When the lift fell though the floor, it tilted everything forward, and over it went. Luckily, nobody got hurt that day. I just had to buy the customer a new gear case that was damaged on the press when it fell. The floor was said to be 8" thick, but where the lift fell through it was 2". Hmmmmmm?? I wonder if all those add-on weights are OSHA approved? When you need to set a load down that is to heavy and will over center the truck due to the angle of the mast, you need to crib the bottom of the mast tight to the floor. This changes the leverage point from the centerline of the axle to the mast. The load can be lowered safely. I've been told that the Hyster S155XL (or S7.00XL in Euro speak) is build the same as the S180XL/S9.00XL only with a shorter frame/couterweight. So your Hyster S155 could lift 18K lbs /9 tons without being overload *, just tipping over without extra counterweight. Always let the truck do the moving when you have to load or unload a maximum load lift. That 4' high lift and moving will get you. With the forks Four inches off the floor you can move slow. Common sense works well. Once you start lowering dont stop midway or the added weight from the momentum will tip you. I think 18,000# is pushing it as stated. Loss of steering without extra counter weight. with temporary added counterweight ? A US made counterweight or an import? Careful, because I don't think we can talk about imports here. The site owner has a thing about that. They really need to put a larger universal counterweight step on the back. There is hardly room for one to safely mount the forklift, let alone two. I went to repair a fork one day,and the owner had borrowd a smaller fork from nextdoor to remove the counterweight............as soon as he tried to reverse ,the little fork tipped up,so he called out for his wife........she added her considerable bulk to the counterweight,and it was easily removed.